Paramount Digital Entertainment announced on Tuesday the release of Top Gun for the iPhone and iPod touch. Based on the classic movie, Top Gun for iPhone and iPod touch costs $2 (a special introductory price — it will go up to $4). Take to the skies in a F-22 Raptor or B-2 Spirit. 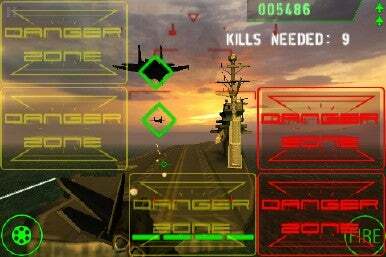 Top Gun — developed by Freeverse Software (and previewed by Macworld in April) takes you to the United States Navy Fighter Weapons School, where instructors Maverick and Iceman help you compete to become the next Top Gun. You take to the skies in modern aircraft like the F-22 Raptor or the B-2 Spirit stealth bomber, dodging incoming missiles and shooing down enemy MiGs. Two game modes are included — Story Mode and Instant Action, which lets you replay previously-completed missions. The game features 10 missions and varied environments like oceans, deserts, canyons and city centers, in the daytime and at night. The game features aerial and ground-based obstacles and even sports some music from the popular ’80s-era movie upon which it’s based. System requirements call for iPhone 2.2.1 Software Update.